From Berwick to Sydney communities across Nova Scotia are asking how to create vibrant main street districts that balance the needs of all road users. The National Association of City Transportation Officials will be in Halifax on June 12th to teach engineers, planners, and landscape architects how to design our streets to encourage active transportation and reduce our dependency on single occupancy vehicle trips, whether in downtown Halifax or Main Street in Antigonish. How can our main streets be improved to encourage walking and biking? How do we accomodate transit vehicles in narrow areas? What are the best ways to design for effective snow removal? The National Association of City Transportation Officials (NACTO)'s design guides have been embraced by Toronto, Montreal, and Vancouver as the right way to redesign main streets. On June 12th the Halifax Cycling Coalition is bringing their trainers to town. This workshop will give engineers, planners, and landscape architects the answers they need in order to design the next generation of Nova Scotia streets. From curb extensions to bench placement, bike lanes to turn lanes, we have you covered. 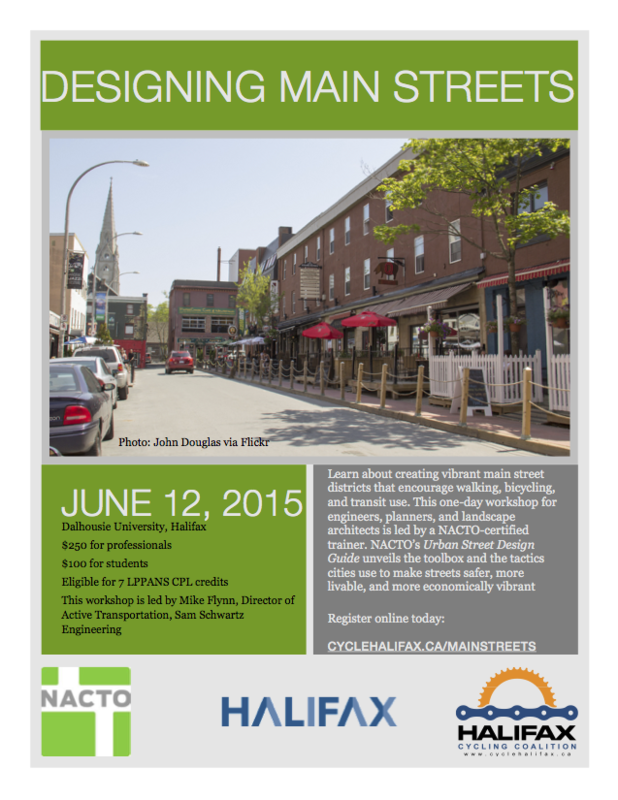 This workshop will provide an overview of NACTO's Urban Street Design Guide, the Urban Bikeway Design Guide, and include a case study chosen by the Halifax Regional Municipality. Participants will receive this valuable training from Mike Flynn, a NACTO-certified trainer and the Director of Active Transportation at Sam Schwartz Engineering. Mike Flynn specializes in the transformation of streets and public spaces to create safe, livable, economically vibrant communities. His advocacy for design and policy innovation is complemented by ten years of experience in the public sector funding and implementing projects, navigating approvals and gaining community support, resulting in solutions that are both cutting-edge and feasible. Mr. Flynn’s work has spanned multi-modal safety and complete street projects, design guidelines, public space design and placemaking, green infrastructure and climate resiliency, capital program development and economic analysis. It has won multiple awards and played a key role in New York City’s shift to become a leader in sustainable transportation. He educates the public, fellow practitioners and the next generation as a frequent public speaker and a faculty member of Pratt Institute in Brooklyn, New York. Mr. Flynn has a B.A. in Computer Science from the University of Vermont and an M.S. in City & Regional Planning from Pratt Institute. The National Association of City Transportation Officials (NACTO) is a 501(c)(3) non-profit association that represents large cities on transportation issues of local, regional and national significance. NACTO views the transportation departments of major cities as effective and necessary partners in regional and national transportation efforts, promoting their interests in federal decision-making. We facilitate the exchange of transportation ideas, insights and best practices among large cities, while fostering a cooperative approach to key issues facing cities and metropolitan areas. As a coalition of city transportation departments, NACTO is committed to raising the state of the practice for street design and transportation by building a common vision, sharing data, peer-to-peer exchange in workshops and conferences, and regular communication among member cities. We believe that by working together, cities can save time and money, while more effectively achieving their policy goals and objectives. The Halifax Cycling Coalition is an organization of concerned citizens dedicated to improving cycling conditions and raising awareness of cycling issues in the Halifax Regional Municipality. The HCC believes that increased bicycle use has the potential to reduce traffic congestion, reduce HRM infrastructure spending, improve our health, and enhance our urban environment. We want to change the circumstances that discourage bicycle use: inadequate cycling facilities, and lack of education for both cyclists and motorists. The HCC was founded in 2007.